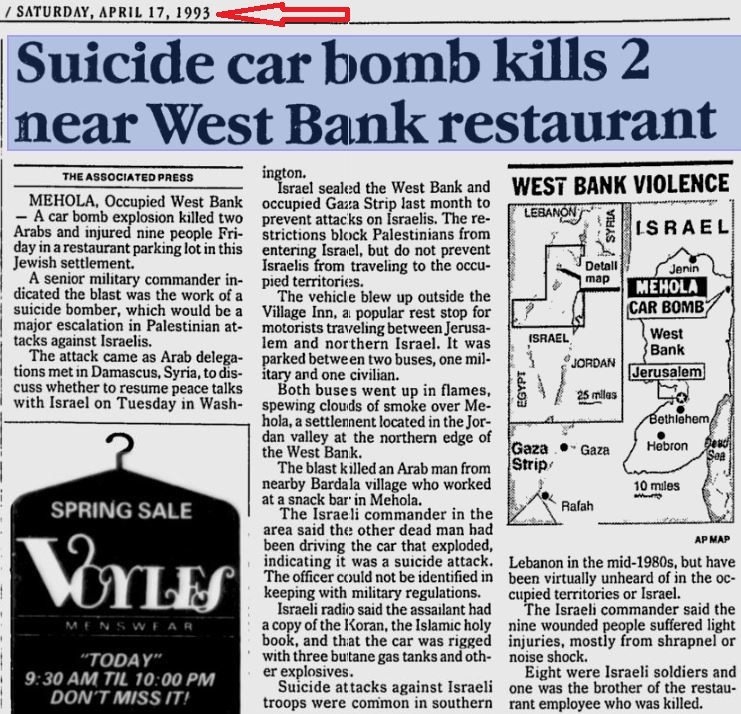 Last week, following communication with UK Media Watch, Times of London editors corrected a false claim, in a May 17th article by David Aaronovitch, that the first Hamas suicide bombing was an act of retaliation in response to Baruch Goldstein’s massacre of 29 Muslim worshipers in 1994. Before securing the correction, we had pointed this out to Aaronovitch in the following tweet. Aaronovitch responded to our tweet, acknowledging the error. Whilst the original language claimed that “the first Hamas suicide bombing…was supposedly in retaliation for this attack”, the new language qualifies the words to note that the the 1994 suicide bombing of a school bus he’s referring to was the first such attack “causing [Israeli] fatalities”. But, this admission completely undermines Aaronovitch’s argument, as the previous Hamas suicide attacks – again, before Baruch Goldstein’s attack – were of course also designed to cause Israeli fatalities, even if they were ‘unsuccessful’. So, Hamas’s sadistic tactic of launching Palestinian suicide bombers to murder Israeli men, women and children, the timeline now shows, had nothing to do with Goldstein’s act of terror. The derailing of the Oslo Peace Process is multifaceted. First, the PA rejected their offered state, and they did not produce a counterproposal outside of demanding a full right of return into the other state. Then, the Western Media decided that it wasn’t necessary to hold Arafat’s feet to the fire. That they, instead, could sell a lot more papers describing Palestinian attacks on Israelis going about their normal days as some sort of Resistance. Aaronovitch … just another sad joke. Excellent research debunking the sloppy and obvious anti-Semitsm of the Times article.